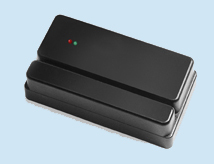 The M400 is a low cost magnetic stripe reader available with either a PC wedge connection (direct connect to a PC keyboard), RS232, wiegand, F2F, or PC port-powered (direct connect to a PC serial port). The PC port-powered version is powered from the PC serial jack and therefore does not need an external power supply. The M400 is available with Track 2, or Tracks 1 and 2. These readers are factory programmable to your specifications. The M400 is available as an OEM product only.